Poet Judith Werner: I thought it would be the mouse. Artist Se Thut Quon: I responded to the loneliness of the grand perspective. Poet Judith Werner: It was the stars that made me see the phrase “eternal abundance” as relating to the universe. When you began this piece, what aspect did you follow? Artist Se Thut Quon: I could visualize the changing frames of reference while the word dream conjured science fiction. I wanted to create a scene that was both big and small. Pasta made me think of my mother’s colander, and then the image seemed to make sense. 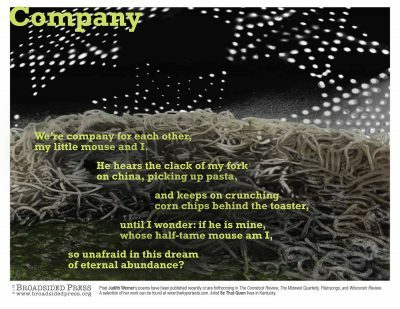 Poet Judith Werner: I am delighted by the surprising pasta, and awed by the visual pun of the upside down colander-hole stars representing stars overhead. It took me a few looks before I “read” the colander. At first I thought it was heaven over pasta, a wonderful mouse-eye view. Poet Judith Werner: I once wrote a poem about Renoir’s girl in blue holding a watering can because that hung in my childhood home and my mother often said it looked like my sister. One of the many editors rejecting it said he had too many poems about Renoirs! If the Broadsided collaboration were a piece of music, what would it be?. Poet Judith Werner: Something humorous and profound by Mozart, perhaps Eine Kleine Nacht Musik. Artist Se Thut Quon: I heard it just the other day. I’m sure you would know it. It was so familiar but I don’t know its name. Poet Judith Werner: Lots of adventure mysteries, several coincidentallly featuring Mayan codexes, but the “good” book I recently read was Remembrance of Things Past by Marcel Proust. Poet Judith Werner: My sister, the little girl with the watering can, is now a mature artist. I recently saw via the internet a painting of hers entitled Grandma Moon that I liked a lot. Poet Judith Werner: I love the idea that I don’t know the folks at Broadsided, nor the artist who was called by my work to create a visual piece, and yet my words spoke to you. The collaboration is “inspiring” to me, and I hope it is inspiring to those who encounter it from the launch onwards. Poet Judith Werner lives in the Bronx, New York. Previously an editor and teacher of poetry, she has won the Lenore Marshall Poetry Prize, The Academy of American Poets Prize, a Breadloaf Writer’s Conference Fellowship, Third Prize in the Jesse Bryce Niles Chapbook contest from Comstock Review and two nominations for the Pushcart prize. An selection of her work can be found at www.thehypertexts.com. Her poems have been published recently or are forthcoming in The Aurorean, Blue Unicorn, The Comstock Review,The Deronda Review, The Lyric, The Midwest Quarterly, Plainsongs, Sojourners, Tampa Review, and Wisconsin Review. Artist Se Thut Quon lives in Kentucky. Poet Judith Werner Vectorizex on her mailbox, where everyone passing by can see! The artist Vectorizes while grocery shopping in Kentucky.